Christy (Jennifer Garner) and Kevin Beam (Martin Henderson) go through a major crisis of faith when their daughter Anna (Kylie Rogers) is diagnosed with a chronic gastrointestinal disorder that could be fatal. Now, the only thing that might be able to help Anna is a miracle. 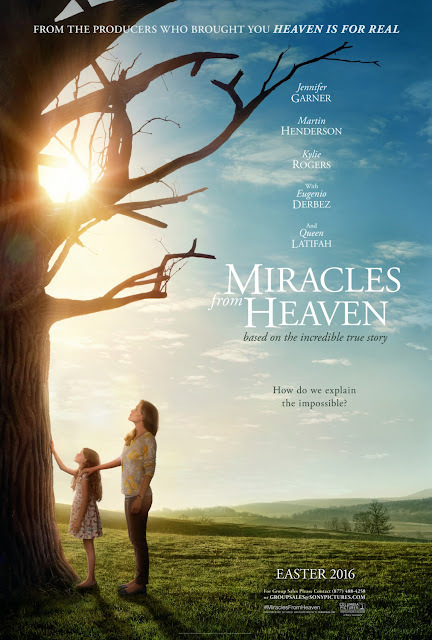 Based on a "true story," "Miracles from Heaven" is the latest release from Sony's AffirmFilms. Like all of their movies, "Miracles from Heaven" is targeted towards Christian audiences in an effort to help reaffirm their faith. These types of films seem to be drawing bigger and bigger stars for their lead roles, and though we weren't absolutely sure we'd be seeing this one, we figured having Jennifer Garner and Queen Latifah was a good sign given its relatively cheap production. This movie tells the story of the Beam family, whose daughter Anna, played by Kylie Rogers, was miraculously healed from her chronic gastrointestinal disorder when she fell several feet into a hollowed out tree. We would normally call this a spoiler, but since it's shown in every bit of marketing, it's safe to say this is information filmmakers want you to know going into the movie. The overall story is more about the journey this one family goes through, as well as their financial struggles, the balancing of their three daughters, and Christy Beam's own battle with keeping her faith when her daughter is diagnosed with this possibly fatal condition. 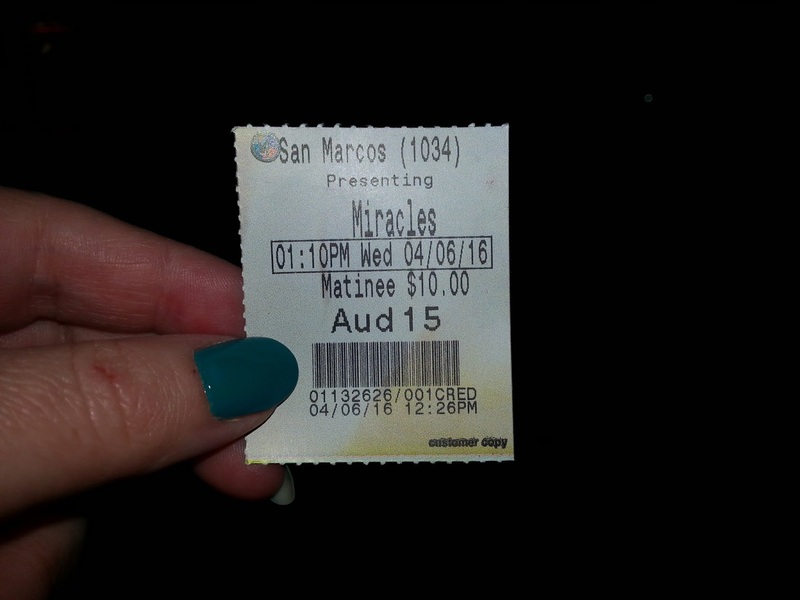 There are good elements of "Miracles from Heaven." Jennifer Garner puts on a good performance as Christy Beam, a mother looking for solutions and becoming frustrated when she can't find any. We've always liked Garner, and she's able to convey frustration, elation, and sadness very well. Kylie Rogers is adorable in her part. The trailers must have showcased the worst parts of her acting because we were worried she'd be one of those child actors who overcompensates their lack of skill with theatrics. Rogers' Anna is as sweet as pie, so it makes it all the more difficult to watch her be put through so much physical torment at the hands of her illness. Eugenio Derbez also is very charming and likable as the Patch Adams-esque pediatrician in Boston named Dr. Nurko. Though we don't have children, you don't need them to understand and get invested in the film's subject matter. It is very emotionally tugging at all the right strings, and only a person with a heart of stone would not to feel sympathy for our sick, dying protagonist, as well as the several other ill children shown in the hospital. As we expected, the movie is also interlaced with massive doses of religion, as well as literal sermons on the importance of faith. These are further inter-spliced with Christian rock montages for both dramatic and godly emphasis. The intended audience will enjoy these portions, but those who do not practice will feel out of place as it starts to feel a little heavy handed when you aren't already a member of the choir. We can put aside our own feelings about religion as best we can, but we hate to see the constant bashing of non-believers and atheists, as well as the field of science. Those who are designated as non-believers are often portrayed as huge jerks with chips on their shoulders who are seemingly unhappy in life. It can get pretty tiresome. Plus, the emotional tugging at heart strings starts to feel a bit less like it's done out of necessity and a bit more like it's done to pander its message another 12 times before the credits roll. All of this being said, "Miracles from Heaven" isn't a terrible film. Though it doesn't speak to us in a significant manner, we didn't completely hate it. It would have been infinitely more compelling to watch Jennifer Garner's Christy never lose her faith instead of pushing it aside when times got tough, only to pray reeeeally hard after an emotional and spiritual layoff when time deemed it necessary. When characters lose their faith in films, something always happens to facilitate the loss, only to have characters change their minds again when stuff gets tough. We'd imagine the greatest test of faith would be during times of hardship, and this would make a much bigger case for becoming a believer than watching someone lose and regain it. Judging by the audience reaction upon completion of this movie, its target audience definitely found "Miracles from Heaven" quite enjoyable because as the credits rolled, people in our screening began to clap, which is a rare occurrence and has only happened 5 or 6 times in 405 movies. One year ago, we were watching: "Safe Haven"